As they knock along the way to the Maasai Mara, they heard a helicopter flying low. 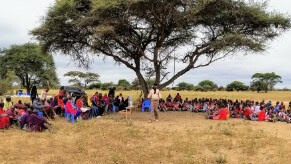 This was the principal day of Di and Leonie's safari and a Kenya Wildlife Service (KWS) chopper was introducing elephant once again into the recreation center. What an energizing method to start their week in Kenya! This post recounts their June safari through Maasai Mara, Lake Nakuru, Lake Naivasha and Amboseli. On their entry they went through the principal night at Wildebeest Eco Camp settled in the peaceful, green suburb of Karen in Nairobi's south-west. Refreshed and revived, they made a beeline for the Maasai Mara the following day. It was on this drive to Kenya's head diversion save that they viewed the KWS helicopter grouping a stray elephant back to inside the recreation center limits. Human-natural life struggle is a consistent test for traditionalists in Kenya and elephants can be especially dangerous in a field of harvests, which can result in striking back from the network whose crops have been crushed. So it's basic to keep the elephants in the security of the recreation center to evade such clash. They entered the recreation center and appreciated a diversion drive as they advanced toward Aruba Camp where they would go through the following two evenings. Amid their time in the Maasai Mara Game Reserve they saw a panther with its supper - a Thomson's gazelle - that it had hauled up into the tree. They additionally observed a panther tortoise, a Marshall Eagle, bison crowds, Lilac-breasted Roller (Kenya's national fledgling), giraffes, elephants, topis, hyena, lions, ostrich and a puff snake. On their entire day amusement drive, they delighted in an outing lunch amidst the savannah. Prior to leaving the Maasai Mara, they visited a Maasai town, which was a more drawn out stroll than foreseen, exhibiting that the Maasai meaning of "not far" may be somewhat extraordinary to an Australian definition! The following stop was Lake Nakuru National Park. They remained two evenings a couple of kilometers outside the recreation center at a camp called Punda Milias ("Zebra" in KiSwahili). More wild oxen here and furthermore rhinos! Makalia Falls at the south end of the recreation center was spouting down as June finishes the stormy season. A short drive took them to Lake Naivasha where they went through a night at Camp Carnelleys. The fervor here was a break in! Monkeys got in their room while they were out. At long last, they went to Kibo Camp, for two evenings at Amboseli National Park. Flamingoes were bounty in Lake Amboseli - which doesn't look much like a lake in the dry season so observing flamingoes here is very unique. Being the administrator lady, I don't regularly get the chance to meet our visitors, notwithstanding as a rule spending numerous months messaging each other arranging their safari. So if there's a reason to complete an air terminal get or drop off or something comparable then I wouldn't fret. This time it was a camera case and battery deserted in the vehicle. Di and Leonie had gone on to Tanzania and were flying back to Nairobi and after that on home. So amid their travel, I went to the airplane terminal to endeavor to convey the things. It was somewhat of a mission and it was great that they had a few hours to kill. I was passed from column to post until one movement official disclosed to me that Di and Leonie would need to talk pleasantly to the migration officers inside to enable them to turn out to meet me. I nearly surrendered expectation, however then Leonie discovered me meandering outside the terminal! Incredibly it had worked. Battery conveyed, we made our ways home... one voyage essentially unique to the next, most likely mirroring the critical contrasts in experience each had quite recently had. 0 Response to "Strolling With the Maasai and Other Adventures "